Huge Fire Kills At Least 11 And Destroys Hundreds Of Homes In Chile : The Two-Way In Chile, a large fire has reportedly killed at least 11 people and destroyed 500 homes. Thousands of residents have been forced to evacuate areas near the port city of Valparaiso. 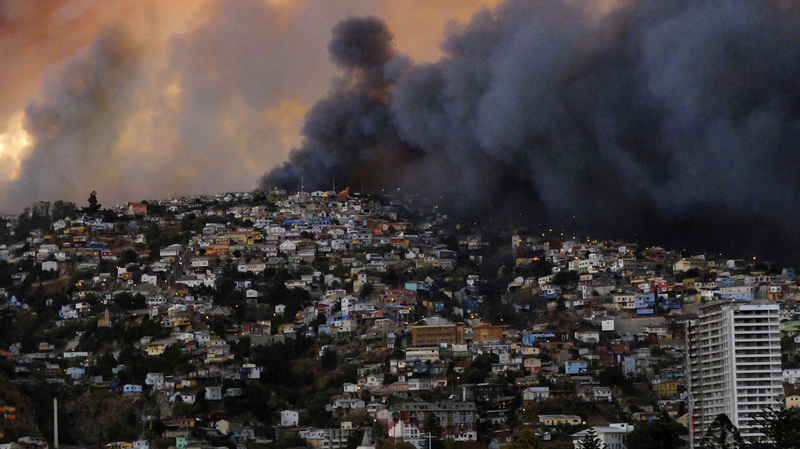 Smoke fills the sky behind a hill in Valparaiso, Chile, Saturday. The large fire burned through the night and is blamed for at least 11 deaths. In Chile, a large fire that burned forest land and consumed houses has reportedly killed at least 11 people and destroyed 500 homes. Thousands of residents have been forced to evacuate areas near the port city of Valparaiso. The BBC says the death toll had been 16, but it was dropped to 11 after authorities realized a family had been counted twice. President Michelle Bachelet has declared a state of emergency and put the military in charge of maintaining order. The fire started Saturday afternoon, officials say, and raged overnight. "Firefighters battled the flames that ripped through Valparaiso, located 75 miles northwest of the Chilean capital of Santiago. But their efforts were hampered by strong winds that blew hot ashes onto many wooden homes. "President Bachelet traveled to Valparaiso to oversee the emergency response. Authorities have evacuated residents of the surrounding areas, including 200 female inmates from a prison. But the historic section of the city, which is home to the country's Congress, was undamaged." Strong Pacific winds helped to fuel the blaze. Some 1,200 firefighters have battled the fire; they're rushing to put out remaining hotspots before winds pick up again later today, according to the Buenos Aires Herald. "We fled from the La Cruz neighborhood, from an apartment I just got not too long ago. It's all burned down, my sister's house also burnt to the ground," a victim of the fire, Rosa Guzman, tells Reuters.